What Will the ‘Billie Jean Delegation’ Mean for LGBT Rights in Sochi? The Obama administation has made a welcome and provocative choice to represent the United States in Sochi. Anyone who opposes the draconian anti-gay laws in Russia, and supports the emerging movement of LGBT athletes in the sports world, should take serious note of the latest news out of Washington, DC. President Barack Obama’s White House has chosen their official delegation for the opening and closing ceremonies of the 2014 Winter Games in Sochi. For the first time since 2000, this group will not include a current or former president or vice president. Instead, the faces representing of the United States will include out-and-proud tennis legend Billie Jean King and out-and-proud two-time Olympic hockey player Caitlin Cahow. King was chosen even though she made an explicit plea for athletes to defy the International Olympic Committee’s decree against political statements in Sochi, saying in September, “Sometimes I think we need a John Carlos moment.” This was a reference to the great 1968 Olympian who along with Tommie Smith raised his fist for civil rights on the 200 meter medal stand. Caitlin Cahow’s story is far less known than “the legend of Billie Jean” but she is also more than an athlete. Cahow is an activist who is part of what is known as the Principle 6 Campaign. This is a movement that aims to pressure the craven International Olympic Committee to actually enforce Principle 6 of its own charter, which states, “Sports does not discriminate on grounds of race, religion, gender, politics or otherwise.” Their work has already pushed the IOC to state that “otherwise” includes sexual orientation. The appointing of King and Cahow is in so many respects a tribute to the movement over the past year of LGBT athletes to make sure the locker room no longer continues to be the last closet. It is also, let’s be clear, a diplomatic power play by the Obama administration. The White House just delivered a thumb to the eye of a country that has challenged US hegemony in Syria and East Asia, and provided safe haven to NSA whistleblower Edward Snowden. There is a strong element here of the administration using LGBT rights like a pawn on a chessboard against a country that is more adversary than ally. It is hard to see it as anything else considering the lack of commentary from the Obama administration on ally India’s recent anti-LGBT legislation. In addition, this White House’s own piss-poor record in pushing The Employment Non-Discrimination Act (ENDA) and the attendant fact that it is still legal in twenty-nine US states to fire people on the basis of their sexuality, should be mentioned every time this administration speaks out for LGBT rights internationally. 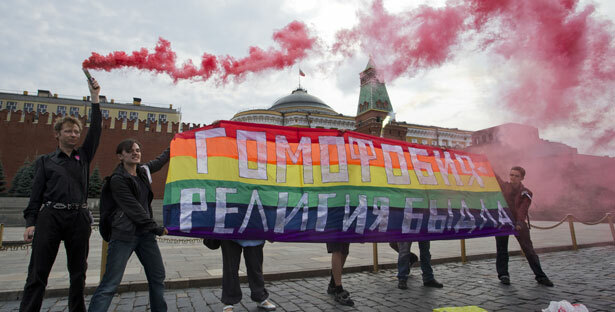 The most important question however is whether this move by the Obama administration to send the “Billie Jean delegation” will serve to make the situation on the ground better for LGBT people in Russia or will it just serve to open the door for more repression? Will this provide a pretext for Putin to maliciously say that LGBT activists inside Russia are just tools of the United States? Does the intervention in a grass roots movement by the world’s number one superpower create more or less oxygen for the brave people fighting for their freedom inside Russia? After the smoke has cleared and all the delegations have gone home from Sochi, it is the only question that really matters.